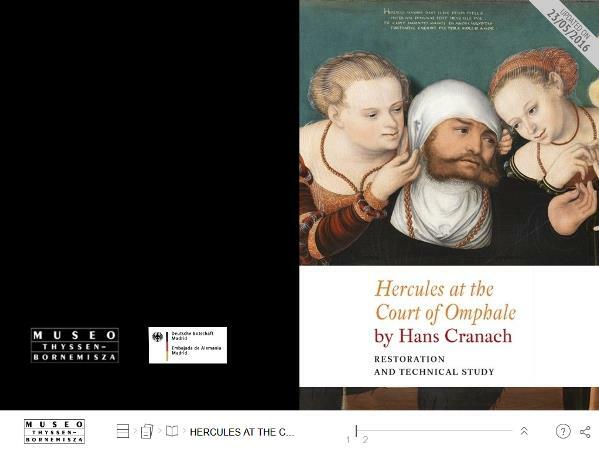 On display until 2 March 2014 in the Museum’s Main Hall is a presentation of the painting Hercules at the Court of Omphale (1537) following the restoration and technical study of this work over the past few months. The project was made possible through the sponsorship of the Embassy of the Federal Republic of Germany in Spain. Alongside the newly restored painting are images of its state of preservation before and after restoration, a video providing details on the restoration, materials analysis, x-radiographs, infra-red reflectography and ultraviolet and high resolution photographs. Following a preliminary technical study, the restoration process primarily consisted of cleaning the painting, removing the layer of varnish that had yellowed over time and correcting old areas of repainting and retouching, in addition to consolidating the support and surface layer of paint. As a result of this endeavour, it is now possible to see the work in the condition in which the artist, Hans Cranach, originally intended it to be seen. It has also gained a greater sense of pictorial depth and it is once again possible to appreciate the rich palette and delicate nuances that were concealed beneath the affected layers.